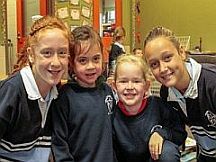 Better Buddies is a whole-school initiative designed to teach and reinforce the positive behaviours and values which underpin social competency. In Better Buddies, older children buddy up with younger children and learn values such as caring for others, friendliness, respect, empathy, responsibility, including others and accepting difference through formal and informal activities as well as four special events: Better Buddies Week, Better Buddies Games, Better Buddies Book Week and Better Buddies Picnic. Better Buddies enables younger students to feel safe and cared for while older students feel valued and respected. This helps to develop safe and caring school communities where bullying is reduced. The Better Buddies Program is supported by The Alannah and Madeline Foundation.